"God without God: Western spirituality without the wrathful king"
"A compelling book, challenging Christians and atheists alike. He presents a deeply authentic spirituality which reaches into the profound mystery of the centre of Christian faith. Fr. Richard Rohr, author of "Everything Belongs:"
"Western Christianity is at a major impasse, and this book gives you the major reasons why. As long as we have a punitive, petty God, whose love is entirely conditional, how can we expect history to be any different. Thank you Michael Hampson! God without God takes the atheist case against God as a premise, then examines what remains of the western spiritual tradition when the God of presumptive monotheism is removed. It finds right at the heart of the tradition a concept of God, a concept of the divine, far more complex and mysterious than that which the atheist rightly rejects. Far from being destroyed or diminished, the tradition flourishes in its liberation. The Christian faith stands accused of arrogance, hypocrisy, abuse of power, imperialism, dictatorship and genocide, discredited variously by science, rationalism, pluralism, Vatican politics and protestant fundamentalism, and finally rendered obsolete by democracy, wealth, technology, and even the church's own liberal wing. Once the monopoly player in the western spiritual marketplace, it looks increasingly like a bankrupt corporation destroyed by the weight of its own history. God without God has no argument with science or atheism or pluralism - indeed it takes these as its premises, then sets out to explore what remains of the western spiritual tradition. It finds right at the heart of that tradition a concept of the divine far more complex and mysterious than that which the atheist rightly rejects. We move beyond theism and atheism to consider the mystery of existence itself, discovering a tradition full of contemporary resonance, with a profound and timeless integrity for body, mind and spirit. Title: "God without God: Western spirituality without the wrathful king"
"Religion of Fear: The Politics of Horror in Conservative Evangelicalism"
"Jason Bivins takes readers on an engaging but unsettling tour of 'the dark corners and sub-basements of American culture,' from Hell Houses to comic books, and along the way we learn a great deal about religion and politics in the United States. Indispensable for those interested in popular culture and conservative evangelicalism." 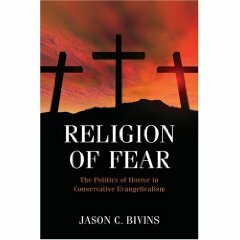 "In this fine work of critical cultural analysis, Bivins finds the anxious heart of modern conservative evangelicalism in the United States, showing that fear, powerfully nurtured and exacerbated, has been a potent energizer of Christian public activism. This is a dark but necessary story. Democracy always has its demons, and it is best we know their names. This is a sharp work of social and religious analysis that deserves to be widely read." "Jason Bivins takes us on a fantastic tour of Christian Right efforts to -- quite literally -- scare the hell out of true believers. Along the way, Religion of Fear reveals edgy new ways of drawing the age-old line between a righteous us and a sinful them. Lucid, graceful, fun, and disquieting." Conservative evangelicalism has transformed American politics, disseminating a sometimes fearful message not just through conventional channels, but through subcultures and alternate modes of communication. Within this world is a 'Religion of Fear,' a critical impulse that dramatizes cultural and political conflicts and issues in frightening ways that serve to contrast "orthodox" behaviors and beliefs with those linked to darkness, fear, and demonology. Jason Bivins offers close examinations of several popular evangelical cultural creations including the Left Behind novels, church-sponsored Halloween 'Hell Houses,' sensational comic books, especially those disseminated by Jack Chick, and anti-rock and -rap rhetoric and censorship. Bivins depicts these fascinating and often troubling phenomena in vivid (sometimes lurid) detail and shows how they seek to shape evangelical cultural identity. As the 'Religion of Fear' has developed since the 1960s, Bivins sees its message moving from a place of relative marginality to one of prominence. What does it say about American public life that such ideas of fearful religion and violent politics have become normalized? Addressing this question, Bivins establishes links and resonances between the cultural politics of evangelical pop, the activism of the New Christian Right, and the political exhaustion facing American democracy. Religion of Fear is a significant contribution to our understanding of the new shapes of political religion in the United States, of American evangelicalism, of the relation of religion and the media, and the link between religious pop culture and politics. Jason C. Bivins is Associate Professor of Religion at North Carolina State University and the author of The Fracture of Good Order: Christian Antiliberalism and the Challenge to American Politics. He lives in Durham, NC. Title: "Religion of Fear: The Politics of Horror in Conservative Evangelicalism"
"Post 9/11 has seen an explosion of publishing on Islam. For many, the question is who do I read if I only have a limited amount of time and want to know what and why Muslims believe what they believe? The Muslim Next Door is an excellent place to start. Sumbul Ali-Karameli presents Islam as a living and lived faith. She combines scholarship with an engaging and accessible style and frank self-criticism that crystallizes the faith and commitment of a majority of mainstream Muslims in its unity and diversity." "An engaging and enlightening work. The author has provided an indispensable vade mecum for anyone interested in a sensitive and feminist perspective on Islam, free of the rhetoric and exaggerations common in contemporary public discourse. The book is conversational in tone and very readable and, although the subject is serious, the author has a gift for applying a lighter touch and humor at just the right moments. It should be read by everyone." Title: "The Muslim Next Door: The Qur'an, the Media, and that veil thing"
"The Jesus Question: Daring to walk the path of peace,"
"In essence, the book asks, if Jesus taught peacemaking, forgiveness, and compassion, and if a Christian is a person who follows Jesus, then why are Christians supporting wars and other violence? It is a call to all Christians to ask, are they Christians in name only, or do they really follow Jesus? I give many examples of courageous people who follow Jesus as they walk through harrowing challenges. I also provide research and suggestions for how we can help our children to make wise and compassionate decisions in order to create a more peaceful world." "This slim, humble volume offers truth in a heart-to-heart talk. Monson writes with a gentle tone and a healing timber. She has the courage to ask what Jesus would do if he were to walk through our playgrounds, supermarkets, battlefields, and polling booths. She challenges us to be honest about our actions that arise from fear. The tonic for those fears is God's love." "Monson challenges her readers to reflect on the choices they make -- do they lead to peace embodying the message of Christ and if not, why is this?" "A thoughtful and timely book. Readable and clear. Anyone who asks themselves, "What would Jesus do?" Needs to read this book. One wonders why Ms Monson's critical questions have not been shouted from every pulpit. The inconsistencies in the actions and words of Christians are long overdue for a careful examination. This is it." "I have long been troubled by the linkage between religion and violence. On one hand, all of the major religions of the world teach some version of the Ethic of Reciprocity (a.k.a. Golden Rule). On the other hand 9/11 and the vast majority of terrorist attacks ever since have been perpetrated by deeply religious people who are motivated to violence by their faith." This book offers hope. 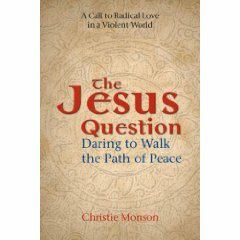 Title: "The Jesus Question: Daring to walk the path of peace"
Christine Monson is a public school teacher, writer and educational consultant who lives in Pacific Grove, CA. She currently serves as a private tutor and consultant to parents and students. She has served as an elder in the Presbyterian Church (PCUSA), and now meets with others who practice contemplative prayer. "Selfless Spirit, Selfish Ego is inspired by Oprah Winfrey's unprecedented worldwide gathering on the Internet, featuring author Eckhart Tolle's bestselling spiritual book, A New Earth: Awakening to Your Life's Purpose. Oprah revealed that one of the most-asked questions about A New Earth is: 'Will it interfere with my religious beliefs?' Award-winning author, John Cord, presents the spiritual substance of the Bible's Message in hope that the over 3.5 billion people who follow Bible-based religions will come to a meeting of the minds about its teachings of The Way of the Spirit of Selfless Love. John Cord reconciles centuries of controversy about Biblical scripture to The Way of the Spirit regarding such central issues as God, Christ, Islam, Israel, the Temple Mount, religious terrorism, abortion, homosexuality, marriage, '666,' secular progressives, the 'war on Christmas,' salvation, damnation, prayer, charity, tithing, baptism, reincarnation, predestination and the puzzling Book of Revelation. This book is intended to help illuminate your spiritual path." 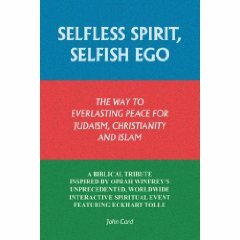 " 'Selfless Spirit, Selfish Ego: The Way to Everlasting Peace for Judaism, Christianity, and Islam' is a look at the three relationships and why peace and harmony between them is possible. Explaining such modern critical issues such as homosexuality, abortion, secularization, and others - and how each of the three religions view them in a similar light, it's an eye opening account that we aren't all so different, 'Selfless Spirit, Selfish Ego' is especially recommended reading for students of religion, as well as non-specialist general readers with an interest in the subject." Title: "Selfless Spirit, Selfish Ego: The way to everlasting peace for Judaism, Christianity, and Islam"
on Religion in America-and Found Unexpected Peace"
William Lobdell's journey of faith and doubt may be the most compelling spiritual memoir of our time. Lobdell became a born-again Christian in his late 20s when personal problems -- including a failed marriage -- drove him to his knees in prayer. 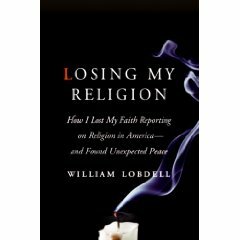 As a newly minted evangelical, Lobdell -- a veteran journalist -- noticed that religion wasn't covered well in the mainstream media, and he prayed for the Lord to put him on the religion beat at a major newspaper. In 1998, his prayers were answered when the Los Angeles Times asked him to write about faith. Yet what happened over the next eight years was a roller-coaster of inspiration, confusion, doubt, and soul-searching as his reporting and experiences slowly chipped away at his faith. While reporting on hundreds of stories, he witnessed a disturbing gap between the tenets of various religions and the behaviors of the faithful and their leaders. He investigated religious institutions that acted less ethically than corrupt Wall St. firms. He found few differences between the morals of Christians and atheists. As this evidence piled up, he started to fear that God didn't exist. He explored every doubt, every question, until, finally, his faith collapsed. After the paper agreed to reassign him, he wrote a personal essay in the summer of 2007 that became an international sensation for its honest exploration of doubt. William Lobdell has been a journalist for 25 years, winning many state and national awards. In 2008 he left the Los Angeles Times after a long tenure. He is on the visiting faculty at the University of California, Irvine. He is married with four boys.